Last night Becasse held their launch of their new “Cellar Night” wine dinner, in which you can actually bring your own wine (from your cellar) to go with their 8-course dinner (set in advance which gives you time to choose what wine you think you have that will go with the whole course, if you want). I could see how white wine could go with the dinner, however in my stubbornness I was set on a red, therefore a Pinot Noir, which is one of the lighter bodied reds. I went for a Tasmanian Pinot Noir. http://www.winewithoutbs.com.au/ also brought a Faisan Estate 1998 unfiltered Pinot Noir – DELISH! Really deep aroma of oak, leather and earthiness, and a silky yet spicy palate. Perfect drinking now. Canape – Black Olive Biscotti w Whipped Goats’ Curd. Loved this. I had some gluten free version of the bread, still with black olives, was dense and delicious. Amuse bouche – Marinated Tuna with Chilled Meditarranean Consomme and Prosciutto. Very interesting array of flavours, with the consomme being in jelly form and fresh raw tuna. Confit Blue-eye w Roasted Prawns, Cauliflower and Salted Buckwheat. Delicious, Light and slightly crunchy with crumbed prawns. Creamed cauliflower went well and the buckwheat added a good texture to the dish. 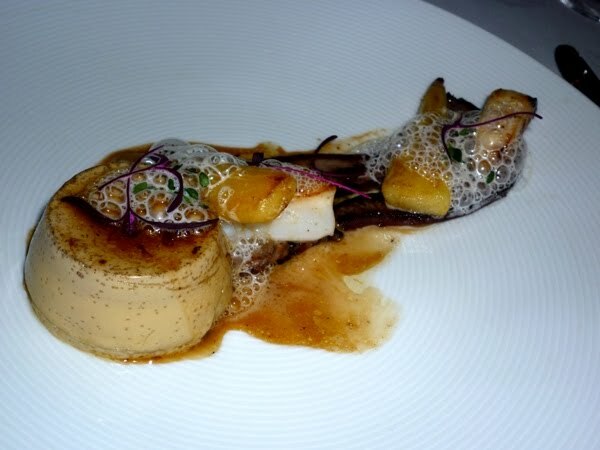 Crepe Royale – Seared Scallop and Caramelised Veal Tongue. This would be one of my favourites. The scallop and veal tongue together was good as the scallop gave some really good texture to the thin tongue, like a layer of pork fat, but more delicate. The veal tongue tasted like a cross between bacon and chicken liver. Caramelised Pork Hock, Forgotten vegetables, Cedar Smoked Potatoes Pork. deliciously tender, Vegies were good (a few I couldn’t identify, I guess hence “forgotten” vegetables), Cedar smoked potatoes were really good and didn’t taste like normal potatoes and as good as or better than duck fat potatoes. Old Telegraph Road Cheese Selection, Sugared Walnuts and Fig Preserve. Wow those sugared walnuts! No crystallised sugar visible, just golden browned walnuts. Cheeses were good quality. Fig preserve was finished in two mouthfuls, should have asked for more. 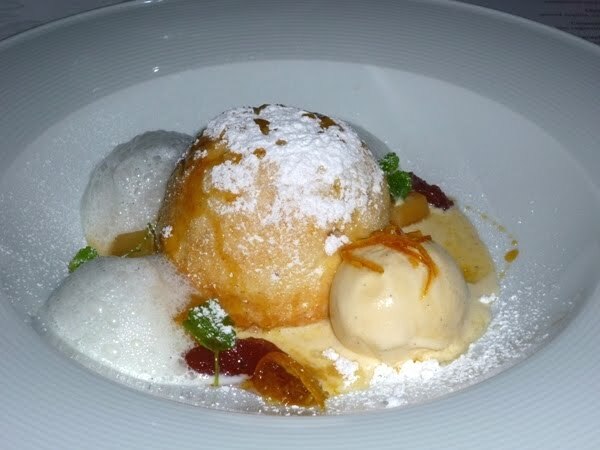 Twice Baked Quince Souffle, Spiced Anglaise, Candied Orange and Vanilla Ice Cream. This souffle was so light, fluffy and tender. First two mouthfuls I enjoyed immensely and the flavours went so well together, then I woolfed down the rest so quick I was surprised my plate was suddenly empty. This was the point I got very full. Also had some little treats after including macarons, mini muffins with a sweet cream on top, gluten free orange friands and some sort of delicate jubes. Oh the macarons had this chocolate fudge filling that was delightful. 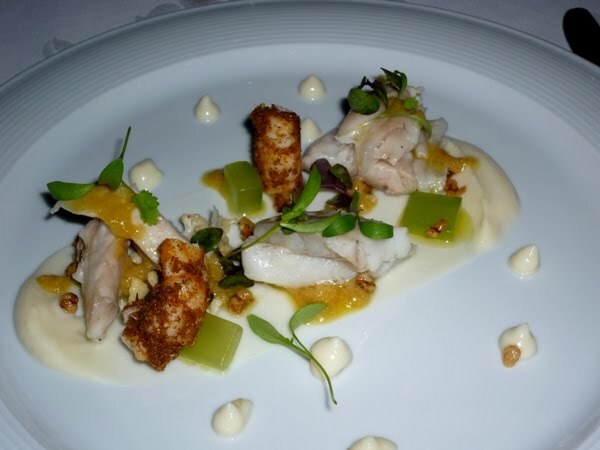 Memorable night, impeccable and impressive service and staff knowledge, and intriguing food! Becasse will have their next cellar night on Tuesday 3rd August at a set price of $150. 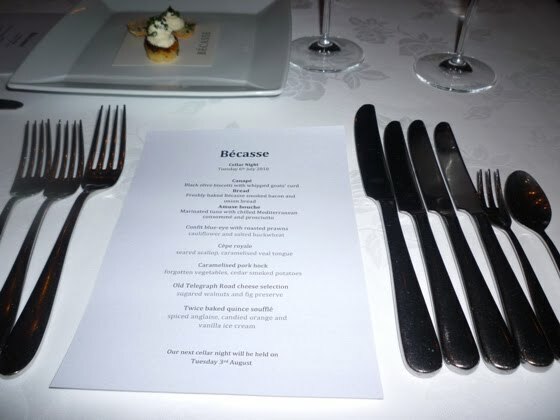 Usually you would expect to spend at least $200 a head for dinner at Becasse. If you are interested there are places available to book from now. http://www.becasse.com.au/ 204 Clarence St, Sydney NSW 2000. Tel: (02) 9283 3440. I'm actually not sure, but it was definitely interesting. I should find out. Wow! What a fantastic looking dinner. The dessert looks AMAZING. I really appreciate restaurants that allow you to bring your own wine, but the ones around here usually charge. Kind of takes the pleasure out of it. Did this restaurant charge? Either way, it looks like you had a great meal!